Description: RRMP. Here is an original photo that I took at the Railroad Museum of Pennsylvania in Strasburg, Pennsylvania, on 30 June 1973. Shown here is Pennsylvania Railroad steam engine #520, an L-1S (2-8-2) "Mikado" built by the Baldwin Locomotive Works during 1916. Description: RRMP. Here is an original photo that I took at the Railroad Museum of Pennsylvania in Strasburg, Pennsylvania, on 30 June 1973. 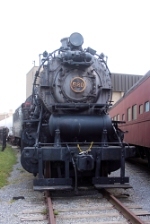 Shown here is a right-rear view of Nickel Plate Railroad steam engine #757, an S-2 (2-8-4) "Berkshire" built by the Lima Locomotive Works during 1944. Partially visible on the left is Pennsylvania Railroad steam engine #520, an L-1S (2-8-2) "Mikado" built by the Baldwin Locomotive Works during 1916. Description: On display at the Railroad Museum of Pennsylvania. Description: At the Railroad Museum of PA. Description: Railroad Museum of Pennsylvania equipment. Description: Pennsylvania RR 520 at the Railroad Museum of Pennsylvania. Description: Railroad Museum of Pennsylvania. Description: Old meets older: AMTK 915 sits in front of PRR 520 both on display outside.